The 2016 Lexus RX 450h Review: In the space of a single year, the Lexus RX has gone from being one of the most innocuous, almost invisible SUVs to one of the most daring. Check out its new nose. It looked so big, so aggressive and so over-the-top in photos that I was worried Lexus might have ruined the driving feel of this vehicle, long known for being soft, silent and inoffensive, with a body to match. Driving the new RX for the first time, though, I was relieved to find it still had the smoothness and ultra-quiet ride of its ancestors. Given the dramatic new styling, I half expected it to have a wailing engine and sports-car suspension, but no. Thank goodness. Its engine is still made of butter, and its shocks are still filled with angel food cake. Granted, the RX I tested was a gas-electric hybrid called the 450h. If you want a more aggressive feel from the driver’s seat to match the wild body, you can get the F Sport package to add some spice with a louder exhaust and adjustable suspension to help it carve corners. As I see it, though, choosing the sport package detracts from the ultimate mission of the RX: transporting you in a reliable, stylish and, above all, in a super comfortable machine. And comfort is what the RX excels at. Not only is it about roomy, easily adjustable seats and a syrupy highway ride, but it’s also the kind of comfort that makes you feel at home as soon as you step inside. There’s a familiar feel to most of the controls and not nearly as much weirdness as you find in some new luxury cars. For example, the shifter is very traditional. It’s chunky, substantial and intuitive, something that flies in the face of other luxury vehicles that are switching to tiny electronic shifters that come with a slight learning curve and, from what I can tell, offer no practical advantage over the tried-and-true chunky levers. Sticking with a traditional shifter shows how Lexus emphasizes ease of use over silly trends. One exception is the RX’s Remote Touch Interface, something I still haven’t gotten used to after years of steady improvements on Lexus vehicles. It uses a small joystick to let you move a computer-style cursor on the screen, which I find more distracting while driving than the simple touch screen interaction you have with most of today’s cars. It takes a small slice of brainpower that I’d rather have focused on the road. The screen it operates on, though, is gorgeous. There’s a standard 8-inch display and an optional, stunningly crisp 12.3-inch version that makes the cabin feel like a sci-fi movie studio. Between the giant screen in the center of the dash and the additional display behind the steering wheel, it almost seems like you’re driving a big-screen TV. It also begs a question: How much is too much when it comes to screen size? It seems like today’s cars, and luxury cars in particular, are in an arms race to see who can install the largest screens in the dash. Some cars, like Teslas and new Volvos, have vertical screens the size of an iPad, but I tend to like the horizontal layout in this Lexus better. It’s especially nice in a split-screen mode you can customize to show exactly the information you want, all while keeping your eyes close to the road. Fuel economy is rated at 31 mpg in the city and 30 on the highway for my hybrid tester, which is pretty impressive for the size and performance you get from this machine. It feels quick when you pull away from stoplights and has a cargo area in back that rivals some huge, brawny, full-size SUVs, yet it gets the gas mileage of a mid-size sedan. Its hybrid system is one of the best you can buy, too, with a steadier feel at the brake pedal and quieter stops and starts from the engine than most of its hybrid competitors. What was tested? 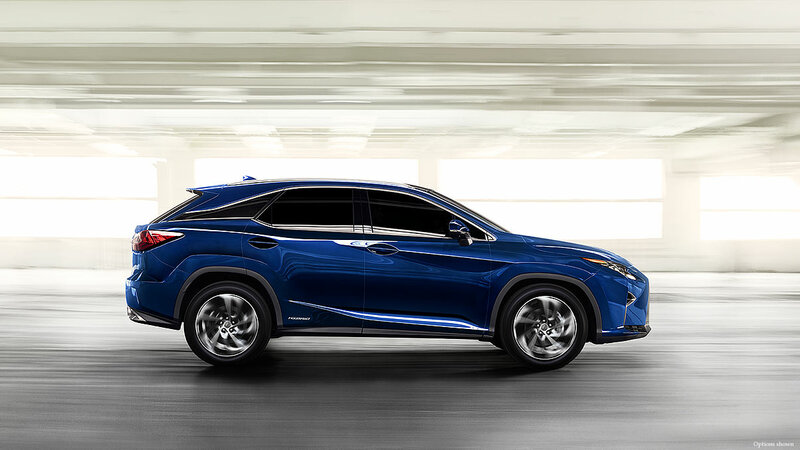 The 2016 Lexus RX 450h with a base price of $52,235. Options on the test car: Blind spot monitor and rear cross-traffic alert for $800, power folding and heated rear seats for $840, Lexus Safety System for $2,550, touch-free power rear door for $200, Luxury Package for $3,125, and the 12.3 inch navigation system for $1,510. The total MSRP price as tested including the $940 destination charge came to: $61,900 Base pricing starts at $41,900 for the RX 350 and ranges to $55,645 for the hybrid with the F Sport package. Why buy it? It has much more aggressive styling this year but still comes with a buttery smooth ride. The hybrid version offers an impressive mix of performance and fuel economy and feels more refined than most hybrids do. The Bottom Line: The 2016 Lexus RX 450h is raising eyebrows for its bold new look, particularly the gigantic “spindle grille” on the front end. It’s a dramatic change for this vehicle that previously had been one of the most conservative luxury crossovers. A huge, optional 12.3 inch center screen dominates the dashboard of the new RX. It offers a smart design that can be operated in split-screen mode and is located in the most logical spot for driving safety: up high, near the windshield. And the all-new Lexus RX keeps that comfy feel with a surprisingly bold body design. Maybe, just for those reasons alone, you should “Drive one, Buy one, Today ©”.